PRINCETON, September 5th/Princeton Patch/The partnership between the Community Action program of Princeton University and Brandywine Living Princeton continues. Last year, Brandywine served as the volunteer site for one of the university’s groups. Through Brandywine, students were able to learn more about the community and had the opportunity to interact, build relationships, and learn from the seniors that they worked with. 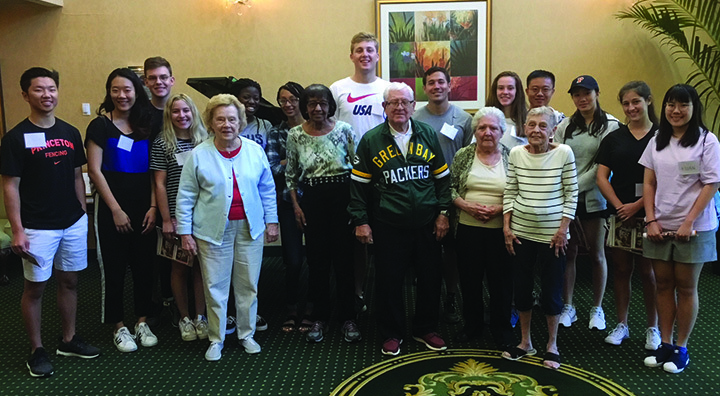 This year, the university sent its first-year students to volunteer at the senior living facility from Sept. 4-6, Brandywine said this week. Community Action is a week-long service orientation program that is designed to facilitate the transition to college by introducing first-year students to the values, expectations, and resources of the Princeton community. During their time in the program, first-year students are introduced to meaningful service and have the opportunity to connect with and learn from community partners and organizations. Students have a chance to eat, sleep, and build friendships with one another and immerse themselves in service. During this year’s program, 14 students are in the building working with seniors from 9:30 a.m.-4:30 p.m. each day. The students went through an orientation upon arriving at Brandywine, then were split into two groups of seven. One works with Reflections and the other group works with Assisted Living residents. Students work with residents conducting programs, engaging in conversation, facilitating small group games such as scrabble, assist with ceramic and working with clay programs and have fun singing at karaoke nights. During their time at Brandywine, students and seniors both benefit for the newly made bonds and friendships.